There used to be a time in sports where positions mattered. And they mattered a lot. In the NBA, 7’0″ guys played center: they played with their back to the basket offensively, and they were primarily used as rim protectors and rebounders. Now, 7’0″ players are on the wing, they’re taking the ball up the floor, and they can shoot from three as if they are a classic shooting guard. The NBA has moved to position-less basketball, with small ball lineups and pace of play becoming much more important that traditional size or positions. Believe it or not, the NFL is starting to make this change as well. Drafting a running back early who can only run the football seems foolish. Everyone wants a guy with a position flex, someone who can line up all throughout the offense and fill multiple roles. A running back has to be able to catch the football, run routes, and make plays in multiple ways. If he can’t? He probably isn’t worth first round capital. Due to this increased creativity offensively, NFL defenses are beginning to adjust. Rarely are teams sitting in their base defense with 3-4 linebackers on the field. Sub-packages with “tweeners” are becoming more common. The league used to be afraid of “tweeners,” but now they must embrace them. Finding a big, athletic, Swiss-army knife player who can be effective in the box as a run defender and in coverage is incredibly important in today’s league. 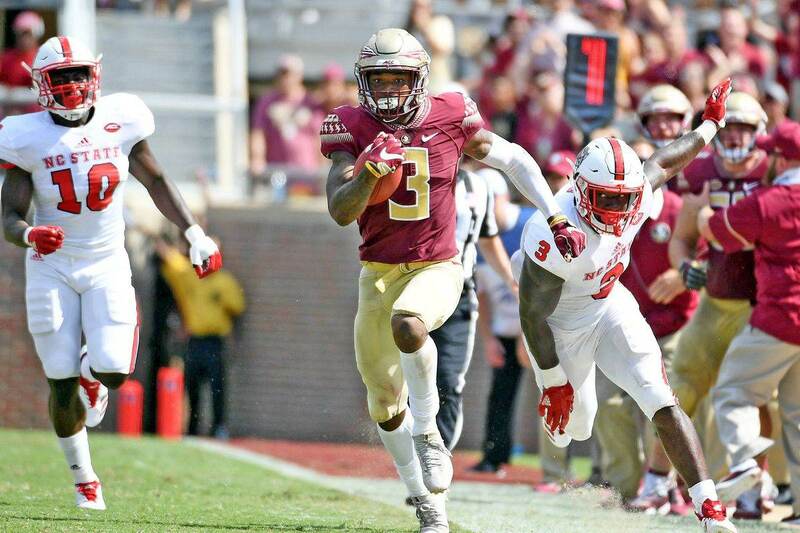 In the 2018 NFL Draft, that player is Florida State safety Derwin James. Derwin James played everywhere for Florida State. Used as a pass rusher, as a run defender in the box, and in coverage often, James’ impact was felt in multiple facets of the game. At 6’3″ 212 pounds, James has the size to match up with NFL tight ends, but has the athleticism to stick with slot receivers as well. While his tape isn’t always perfect, James’ traits immediately jump off the screen. He should shine at the combine, and jump even higher on draft boards. Against Syracuse here we see Derwin James in man coverage. James isn’t too sticky in man coverage, and certainly leaves some room for improvement, but his flashes are about as good as you’ll see from a strong safety. James is lined up in the box and over the running back. Syracuse tries to use their slot WR to pick James and get their running back out on a wheel route. The pick attempt isn’t very good, and James easily avoids it. But his speed and athleticism are on full display here regardless. James catches up to the back on the wheel route, and shows off his ability to win at the catch point, coming away with the interception. On this play against Florida, Derwin James is in the role of a traditional two-high safety. Florida tries to attack the two-high look with a post route, but Derwin James’ instincts and athleticism keep that from happening. He jumps on the route and swats the ball away. I’d like to see James come away with the interception here, but it’s still a fantastic play. James is talented at the catch point and consistently breaks on balls with an excellent burst, but he does miss out on some interceptions from time to time. James might be at his best against run plays and screen passes. He reads, reacts, and attacks the line of scrimmage at an elite level, and he is a relatively sure-tackler once he gets there. On this play, Derwin James reads the screen pass, attacks the ball, avoids the blocker, and makes the nice tackle. James can flat out hit, and he makes his presence felt when taking shots such as this one. Once again we see James attack the line of scrimmage and make a tackle for loss. Originally in man coverage on the slot tight end, James reads that the screen play is coming immediately. He shows off his burst down hill here, and once again avoids a block from an offensive lineman. Then he gets to the receiver and drives him out of bounds. Derwin James also impresses as a blitzer. He is explosive through gaps and consistently got pressure on quarterbacks at the college level. What separates James from other blitzing safeties, however, is his ability to win 1 on 1 situations as a pass rusher. Florida State defensive back Derwin James is a first round player on my board. And if utilized correctly, he will be an impact rookie on an NFL defense from day one. Defenses are beginning to embrace players like James, and they will need to do so in order to keep up with modern offenses.